Steel structures and sub-structures from Steele Solutions are ideal for supporting equipment used in mining operations. Our experienced engineers will design support structures to perfectly complement the dimensions of your mining equipment, and to withstand the abrasive conditions at mines. Ship Loaders • and more – just inquire! Steel structures and sub-structures from Steele Solutions are available with a highly durable power paint finish or hot-dip galvanized for additional protection from harsh environments. The above structures and accessories are designed and built to IBC specifications and allow you to comply with OSHA safety standards. Our drawings are PE stamped. Read more about our engineering. 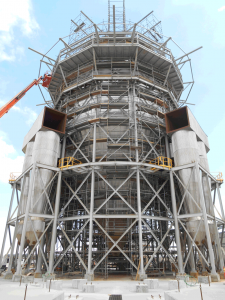 Click here to read a case study on the steel structure we designed and fabricated for U.S. Magnesium. Steele Solutions provides consultation, engineering, fabrication and delivery all in one price. Since 1996, we have been designing and manufacturing structures used in material handling, equipment support, and military settings. We have installations in all 50 states and throughout the world. We’re so confident in our approach that we guarantee 100 percent satisfaction. Call 888-542-5099, or use our quick contact form.